The mild, slightly sweet flavor of scallops makes for a pleasing and nutritious main course. They're low in mercury, according to Maine Sea Grant, so you can include scallops in your diet on a regular basis without having to worry about mercury poisoning. Scallops are packed with lean protein, minerals and vitamins, so they offer lots of nutritional value. A 6-ounce portion of steamed scallops contains 189 calories, which is just shy of 10 percent of your daily calorie needs if you follow a standard 2,000-calorie diet. Each serving contains 35 grams of protein but only 1.4 grams of fat, making scallops a very lean source of protein. The protein in scallops provides amino acids needed to maintain healthy muscles, repair damaged tissues and support hormone synthesis. Just one serving of scallops provides 63 percent of the daily protein intake requirements for men and 76 percent for women. 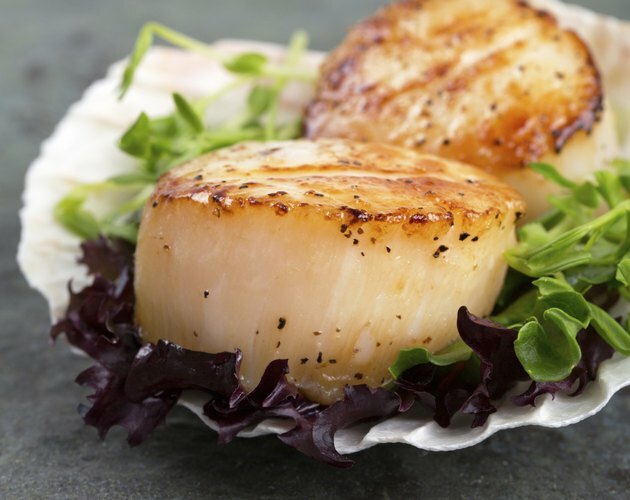 Add scallops to your diet and you'll get a generous amount of selenium, as well as phosphorus. Phosphorus is one of the building blocks for several biological molecules, including phospholipids -- fats used to make cell membranes -- and your DNA. Selenium activates enzymes linked to cancer prevention, sperm production and thyroid hormone function. A 6-ounce serving of scallops offers 36.9 micrograms of selenium and 724 milligrams of phosphorus. This makes up more than 100 percent of your daily phosphorus needs, as well as 67 percent of your daily selenium requirements. Scallops also come packed with vitamin B-12 and choline. Your body uses vitamin B-12 to activate methionine synthase, an enzyme involved in regulating gene activity. It also activates L-methylmalonyl-CoA mutase, an enzyme needed for new red blood cell growth. Each 6-ounce portion of scallops offers 3.66 micrograms of vitamin B-12, which fulfils your entire B-12 requirement for the day. The choline found in scallops maintains healthy nerve transmission and cell communication, and it also supports your metabolism. Eat 6 ounces of scallops and you'll boost your choline intake by 188 milligrams, which is 44 percent of the recommended daily intake for women and 34 percent for men. Scallops contain a significant amount of sodium naturally -- 1,134 milligrams per 6-ounce serving. This makes up approximately half of your daily maximum intake, as recommended by the Institute of Medicine. As a result, you should place additional emphasis on eating minimally processed, low-sodium foods, such as fruits, veggies and legumes, on the days you eat scallops to avoid going over your daily sodium limit. Limit your sodium intake as much as possible by seasoning your scallops with low-sodium toppings. Ditch pre-packaged sauces, which can come loaded with salt, and instead flavor your meal with a splash of lemon juice and a dash of black pepper. As an alternative, use lime juice and cayenne pepper for a fiery main course.